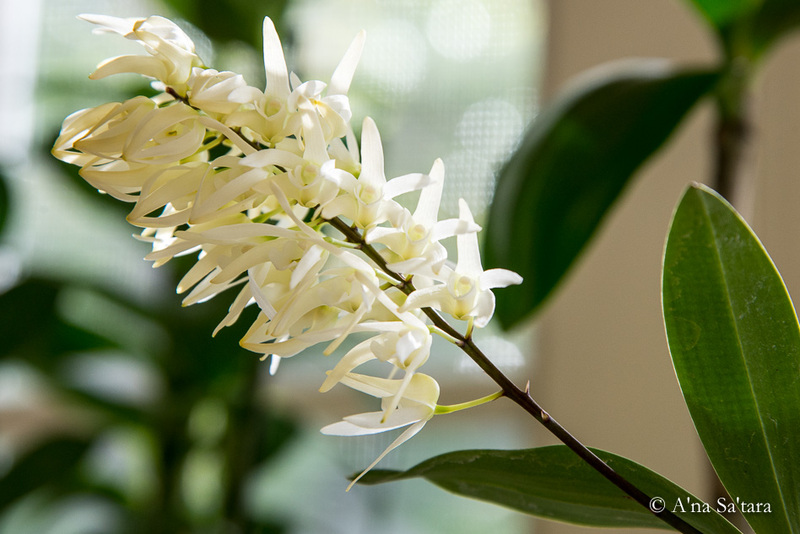 My culture quest for this species began with the usual impetus … my Dendrobium jonesii were not thriving; while not declining, they were not robustly growing like my other Australian dendrobiums. I have a dedicated Australian dendrobium area in the shade house, receiving about 2000-2500fc of light, watered bi-weekly, and misted daily in the warmer months. 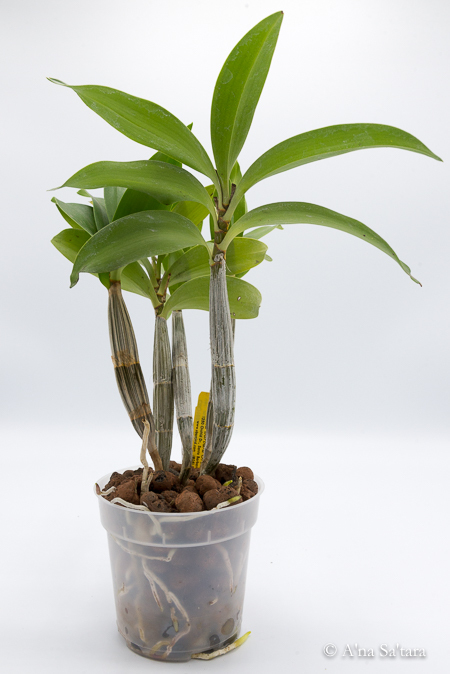 Both of my Dendrobium jonesii plants were potted in granite, the standard culture from Santa Barabara Orchid Estate. 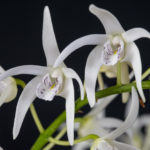 Dendrobium jonesii is a relatively uncommonly grown species (in the USA, that is) that is found in northeastern Australia at elevations from 500-4600 ft. 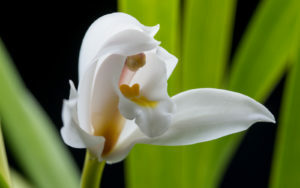 Some botantists consider it a subspecies of Dendrobium speciosum. 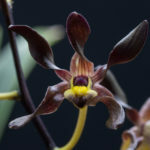 When I researched the culture of this species, I found very little specific information, and most anecdotal reports on the orchid forums were lack of success. The reports of blooming were certainly sparse … otherwise I’m sure that people would have noted the “distinctive” fragrance of this species. Not really unpleasant, but unusual enough to prompt “what’s that?” if you approach the growing bench. Contemplating the Baker climate tables for Dendrobium jonesii, I saw that it had a more dramatic wet/dry season in its native environment than the Australian dendrobium occurring farther south. 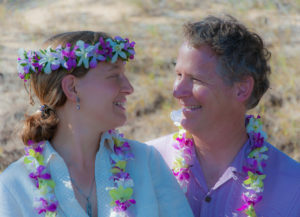 Reflecting on my time in central Queensland, when we received 25″ of rain during the first week of the monsoon season, I decided to make a drastic change in the culture. First, I separated my Queensland and New South Wales dendrobiums. 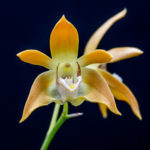 The Dendrobium jonesii and Dendrobium johannis moved to new location with about 2500-3000fc of light. Then I repotted them in hydroton (‘Grow-It’ expanded clay pellets). I have much better success with hydroton as a growing medium than granite; it retains more moisture, more suited for our location. The switch to hydroton was designed to support a change in the watering cycle. To mimic the heavy monsoonal moisture, I began watering the Dendrobium jonesii 4-7 days a week, depending upon the temperatures. The results were quite immediate. 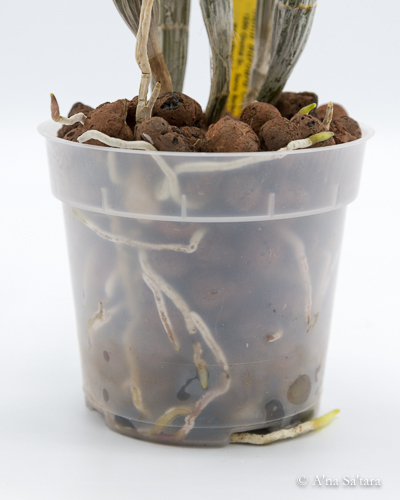 Within two weeks, the larger, seemingly inert plant, initiated a new cane and the smaller plant, which had a new growth, sent out a flush of roots. By the end of the summer, they both had fully developed new canes, and roots coming out of top and bottom of the pot. It was a later season repotting (July) and a little risky, but worked out well in this case. I also decided, based upon the recommendations of Australian growers, to bring them inside for the winter. Australians report best results growing them with a minimum of 45F, though parts of the species’ range drops to freezing temperatures in the winter. My NSW dendrobiums spend the winter outside, carried inside only once or twice a season when it drops into the mid 20s, but experiencing nights in the 30s for about three months. I begin tapering their water in the autumn, decreasing to every two weeks by December. Dendrobium jonesii is not known to need a hard winter rest to flower, and receives regular moisture (heavy mists and dew) in its native environment, even without rain. I mist the plants heavily during the winter to simulate this moisture, and compensate for our stretches of lower humidity here. In spring, the cycle is reversed, with an increase in moisture to the semi-daily watering from approximately mid June- mid September. I do not use set calendar dates for the timing of my watering shifts, as the seasons are variable here, often with cold nights in spring and longer autumn warmth. Our warmest weather is in August and we can have nights in the upper 40s into the first week of July. Dendrobium jonesii, like my other Queensland dendrobiums, favors warmer temperatures, particularly at night, and tends toward a later growing season in our location than the NSW dendrobiums.